Well, 8 weeks flew by. Summers always do move at a rapid pace, but this particular summer seemed to move even faster. My time at the Everhart Museum in Scranton, PA, left a lasting impression in my heart and opened up new worlds that I could explore with the degree I am working toward. As an “art major”, I have been learning to hone my painting and drawing skills by some very fine artists\teachers in our area, and while at the Museum, I was able to put some of that knowledge to work. The highlight of my 8 weeks there, however, was when I was asked to help with condition reporting on the Museum’s textile collection. Since I was about 10, I have been spinning wool and knitting\weaving garments, so this was a big day for me. I quickly agreed to help, and off we went. My favorite piece was a Civil War-era cotillion dress, which was handmade (most clothing was back then). I got an up close and personal look at hand-stitching and hand-made lacework, and I could just imagine the young woman who would have worn the dress to her summer dance in the south. Not only was I able to put my art background to use, but I made lasting connections at the Museum, and I cannot wait to visit with my friends there again. It was bitter-sweet to leave, but I will always hold the memories in a special place in my heart. This entry was posted in Uncategorized on August 22, 2018 by Dana M. Relation. Over the past 10-weeks at the Children’s Hospital of Philadelphia, I have had the opportunity to grow both individually and professionally. I am very grateful to have interned at one of the most prestigious Children’s Hospitals around the world. I was able to participate in projects in a wide array of sub-units within the Office of Safety and Medical Operations, including Performance Improvement, Patient Safety, Behavioral Health, and Emergency Preparedness. For example, I gained hands on experience with work flow process mapping for a behavioral health intake project, as well as the planning and development of an active shooter plan. 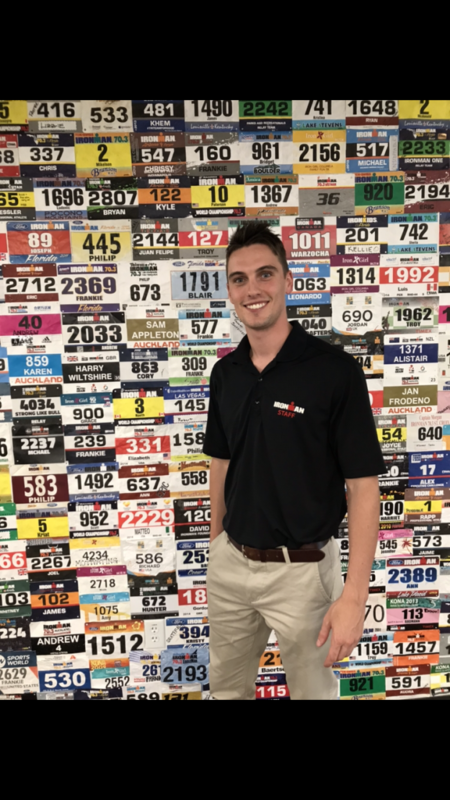 Overall, the most rewarding part of the internship was connecting with many different individuals throughout the hospital. Between meetings, rounding, and projects, I got to meet a diverse range of people, from doctors and performance advisors to the Chief Operating Officer of CHOP. Connecting with all of these individuals allowed me to work on projects that reached many different corners of the hospital, as well as receive valuable professional advice about my future career in health care. One of the most challenging parts of this internship was identifying CHOP’s culture and communication style. Every organization has a different culture, and trying to understand it and integrate it into my own work style was a challenge. However, the ability to recognize and work within different professional cultures is a valuable skill that will serve me well in my future. Overall, this internship at CHOP was one of the best opportunities of my life thus far. Being exposed to so many different aspects of hospital operations and healthcare administration helped to give more direction to my career path and goals. This internship has solidified my interest in health care and I am so excited for the future of my career in the field! 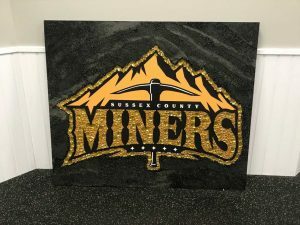 Throughout my time interning for the Sussex County Miners, I have been exposed to the intricacies of what it takes to operate a successful baseball team, which has opened my eyes to the reality that the baseball industry is as grueling as it is entertaining. That being said, my internship has undoubtedly been sprinkled with challenges, some expected and many not, but none that I was not able to overcome. The toughest of these challenges was adapting to the fast-paced, “never-sleeping” environment that is professional baseball. Schedules are planned months in advance, and once a game begins, there is very little—even torrential downpours in some cases—that will stop it, causing everyone to work at full speed during all hours. As challenging as this may have been, I found it to be equally thrilling, as it pushed me to my limits and allowed me to see what I was capable of. I guess the 6 a.m. tarp pulls to cover the field from rain weren’t too much fun either though! Although challenges appeared occasionally, my experience has most definitely been more rewarding than challenging. The most rewarding aspect of interning with The Miners would be the fact that I was truly shown and able to learn about all the different aspects that go in to running a baseball organization. From working the box office, to making group sales, to booking vendors, to working with the media and broadcasting managers to shadowing the General Manager, so much knowledge was shared with me, and I found that you will learn even more if you have genuine conversations with the people doing these jobs. I think it’s safe to say that my internship has helped prepare me for whatever is to come in my future, and for that I will always be grateful! 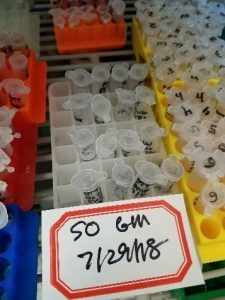 In these past 10 weeks, I’ve spent 250+ hours in the lab at the University of Scranton researching, running protocols and taking care of lab maintenance. 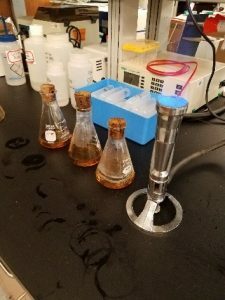 I was able to broaden my technical skills through collaborations with two faculty members in the Chemistry department, Dr. Michael Fennie and Dr. Kate Stumpo. The field of Neuroscience is often heralded as a multidisciplinary area of study, taking expertise in fields of biology, psychology, chemistry, physics and others to understand the mechanisms of cognitive function such as we do in the Biopsychology Lab under Dr. Orr. I found the times spent discussing research with other faculty or student members to be the most rewarding part of my internship. At times my internship was difficult, especially the moments when certain protocols were unsuccessful or obstacles arose due to temperamental machinery. We had difficulty getting a protein concentration curve, setting me off on a week of problem solving with the protocol, but ending up with no resolution. Additionally, more time was spent tweaking the machinery needed for analysis than I had anticipated. 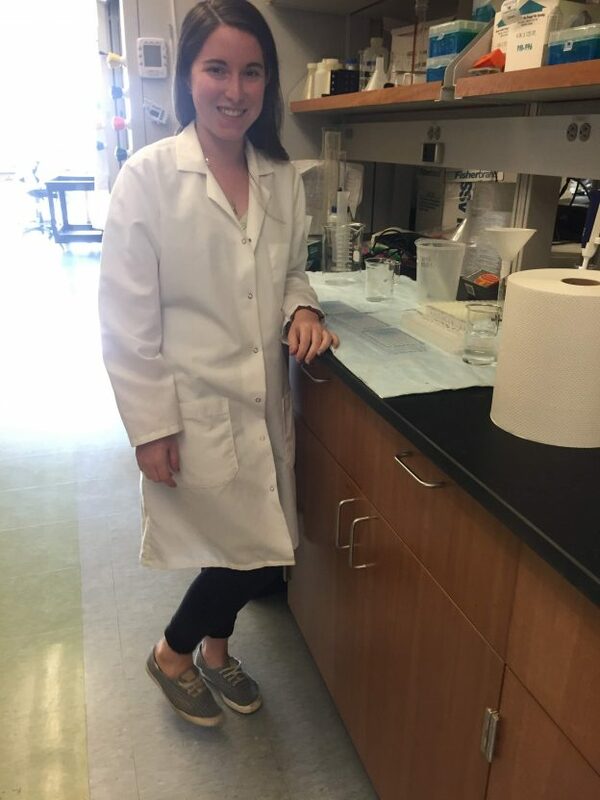 I’m grateful for the opportunity I had this summer to intern with the Biopsychology lab where I could learn the basic schedule of day to day research. 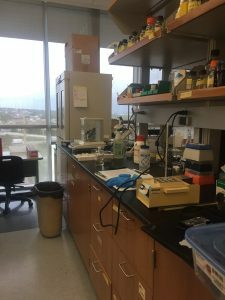 I was able to gain technical skills with protocols for Western Blotting, organic chemistry synthesis, and protein extraction and permethylation in addition to learning about the funding and ordering resources available for a research lab. My pursuit of answers to the questions I ask regarding normal or abnormal brain function, can be answered through my work as a researcher in Neuroscience. However, it can take longer to yield results and require the inclusion of other scientists for a holistic understanding of neural function, and this internship has only confirmed for me that I can be successful as a researcher to add toward our current theories. One major challenge that I’ve found in the course of this internship is that research can be somewhat discouraging. The decimation in the bat population demographics in the Northeastern United States since the White-Nose outbreak in 2006 has been well documented; however, it is different to know this information theoretically than to physically go out in search of bats and come up empty. I think bats are fascinating animals, as well as an essential part of forest ecosystems, so it can be frustrating to do population research and see the depth of the problem firsthand without having any means to help fix the issue. That being said, the experience I’ve gained over the course of the past several weeks has been rewarding overall. 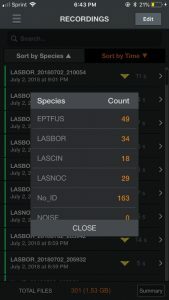 Even though there is no instant gratification or breakthrough associated with this type of population study, it is comforting to know that the data that we collect can help other researchers understand the bat population dilemma in great detail and hopefully take a step closer in finding the solution. We are hoping that our data will be published locally as part of an ongoing study of Northeastern bats post-2006 and that the combined data collected by researchers across the United States may help stop the spread of White-Nose Syndrome. 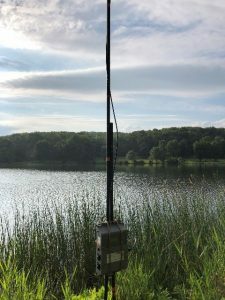 The SM3 recording device and microphone positioned in a bog next to Lackawanna Lake before sundown. The device is very heavy so we have to use several bungee cords to stabilize it on the poles. The microphone (not pictured) is delicate and must be out of reach of both animals and humans. The Echo Meter Touch 2 hardware. This hardware plugs into an iPhone port and communicates with a corresponding app (see Figure 3 and 4). A screenshot from my iPhone. 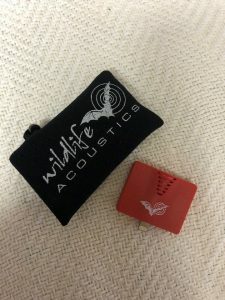 The Echo Meter device (see Figure 2) communicates with the Echo Meter App which records and analyzes bat calls in real time. The column reading “Species” lists off the four species of bat that we have definitively found in Lackawanna State Park and corresponds the species label with their “Count.” The “Count” column does not tell us number of members of that species that we recorded, but merely the number of calls recorded. This makes it difficult to get an accurate population estimate. A screenshot of the Echo Meter app from my iPhone. 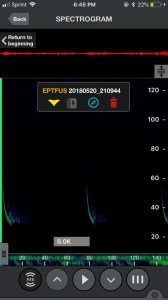 This diagram shows three echolocation calls made by Eptesicus Fuscus, more commonly known as the Big Brown Bat. Though based on the spacing it appears that all three calls were made by the same bat, we have no way of definitively proving whether one bat made all three calls, or three bats each made one call, or one bat made two calls and another bat made the other call, etc.